Instead of a Valentine, I went with Baby card. There are several hearts on this fab Baby Collage, but I only ended up using one of them. There are so many wonderful images on this collage, you could use them as they are, or split them up like I did here. 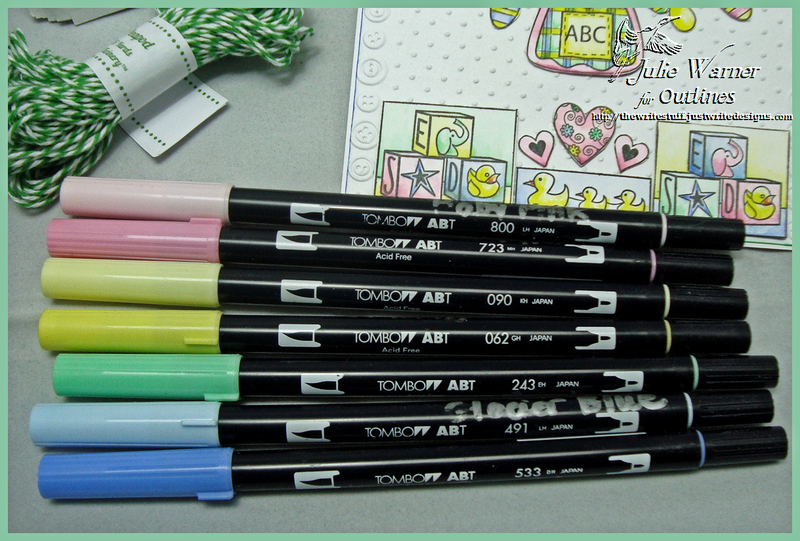 I stamped most of the images on the collage a couple of times, colored them with my Tombow markers and cut them out. The bib, pins and pacifiers were strung on a length of Pepod twine with little bows tied on the ends. 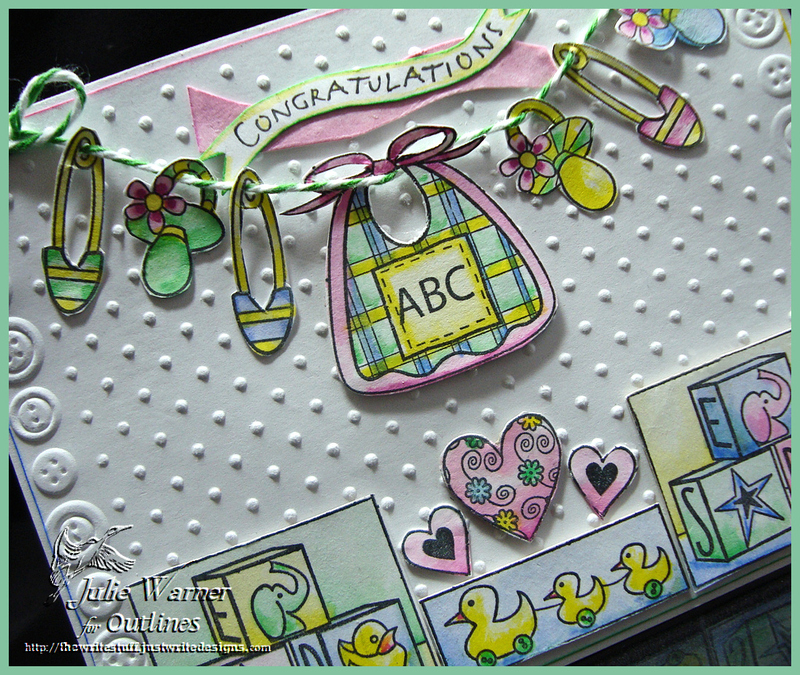 The other images were attached to a white panel I used two embossing folders on. Before attaching this to my 5.50 x 4.25 white card, I used four different colors of markers to edge it. The sentiment was hand cut into a wavy banner shape and added a scap of the leftover (colored pink) behind it. These are the markers I used on this card. And my notebook with my left over scraps and color testing pieces. Super Ways to Use It Challenge (WT359) on Splitcoast! I love to pick my own challenges! This one is really CAS which is odd for me, but I had help because of the 4 WT challenges I chose for this has us case a card in our faves. WT353 Use it or lose it and the one I used was THIS fab card. 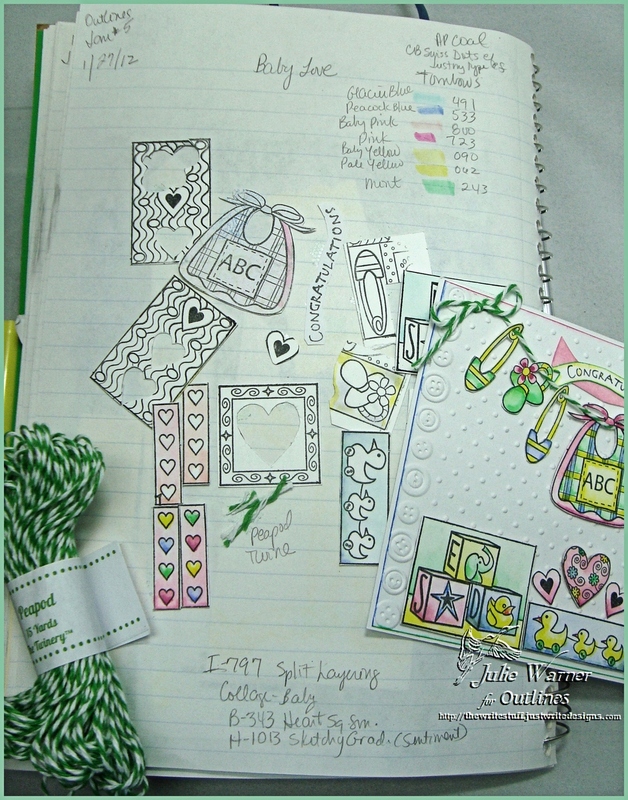 I’m also using 3 other WT’s from this past year: Oval-icious – WT319 , I Heart You – WT308 and Pink, Pink, Pink! – WT344. Whew! If all those links come out right, I’ll be surprised! The image is a new one from DRS Designs and it’s all one image but I stamped it twice and die cut it w/ 2 sizes of classic ovals. I was so happy to see how perfect it fit! I added a little color w/ some markers and attached it to kelly green fancy label. The backgrounds were all embossed w/ the same ef and quickly attached to kelly green layers. The middle one is slightly larger than the others just to make it look right. I added some scored lines and my 5.50 x 4.25 card was finished. This is also for the DRS Thursday Challenge. It’s easy and you don’t have to use DRS images to enter for a chance to win some fabulous images. Come check it out! Today’s sketch challenge (SC369), was for me, a real challenge! It looks great on Taylor’s Abracadabra card, but it gave me fits. It just felt awkward to me to add that strip across the bottom so in the end I just tacked on some little butterflies. Oh well. 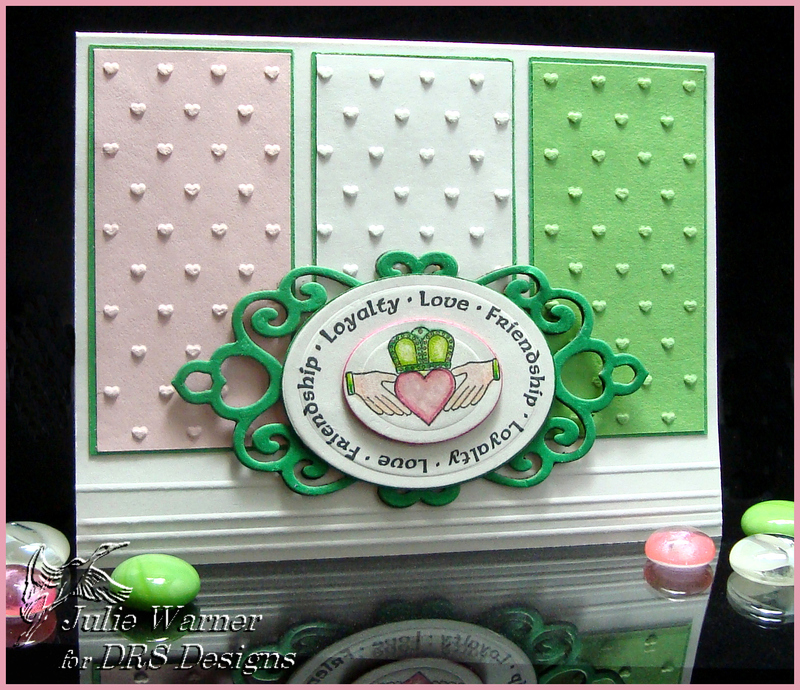 I used a couple of new sets from Our Daily Bread designs. 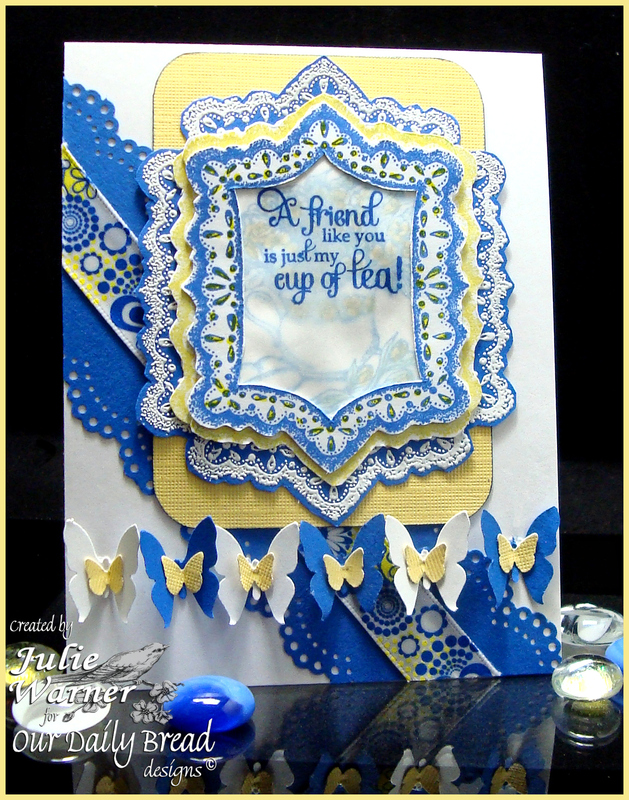 I stamped the teacup full of flowers then stamped the greeting on vellum and placed it on top. IRL, the teacup is a little more obvious. The frame was stamped and the inside cut out and placed on top of the vellum. I stamped another frame in yellow and a third was white embossed on cobalt. I had to cut these two apart to fit them around the original frame. For my diagonal strip, I punched two strips of the cobalt and put a piece of ribbon down the middle. The finished card is 4.25 x 5.50.